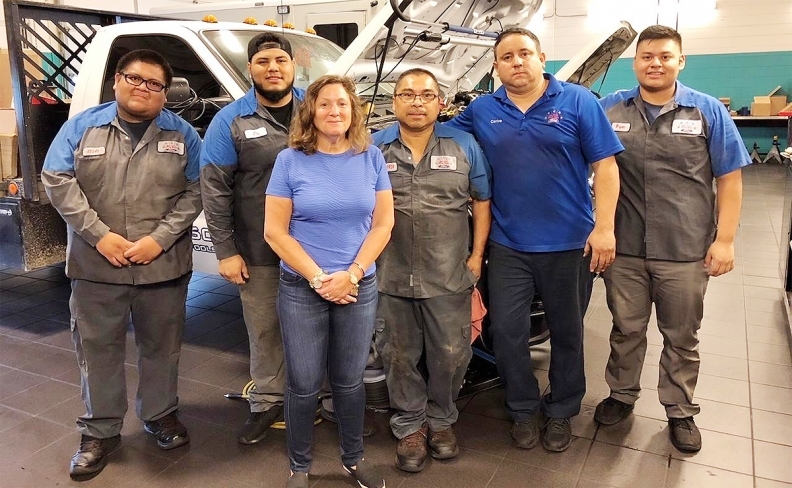 Elena Ford, pictured recently at Sam Pack Auto Group in Texas, with a team of mechanics. Elena Ford, great-great-granddaughter of Henry Ford, will become Ford Motor Co.'s chief customer experience officer as of Nov. 1, the automaker said Monday. Ford, 52, will work with dealers to improve the customer service experience throughout the vehicle-buying process. She will report to Joe Hinrichs, Ford's president of global operations. "Elena is the ideal leader to take on the challenge of bringing Ford to world-class levels in terms of customer experience. She has a genuine passion and unwavering focus on doing what's right for our customers and a deep connection with our dealers," Hinrichs said in a statement. "She has the ability to work across the Ford organization and regions and will ensure that everything we do is designed around the customer." Ford already has traveled to Dallas and Beijing in her new role to work directly with dealership service centers to try to improve processes. She said customers place high value on vehicle service and that the company wants to create a more seamless process. "Customers see the dealers as Ford," she said in an interview. "We have to deliver the most trusted experience for our customers." Ford previously served as vice president of global dealer and customer experience. She helped launch the automaker's FordPass app, which lets users do everything from remotely start their car to find and pay for parking. Separately, Ford said Monday that John Savona, its director of global manufacturing quality, would become vice president for North American manufacturing. The move makes Savona, 50, a company officer and is effective immediately. "John has nearly 30 years of experience in Ford manufacturing, having held leadership positions in many of our manufacturing facilities and been responsible for key areas including global quality improvement," Gary Johnson, group vice president, manufacturing and labor affairs, said in a statement.